On September 21, 1908, Rich Chatterton sent Miss Gladys Rogers of Baker City, Oregon, a postcard urging her to “pack your suitcase” and come for a visit. The message on the back of the card doesn’t even mention the extraordinary studio photograph on its front. 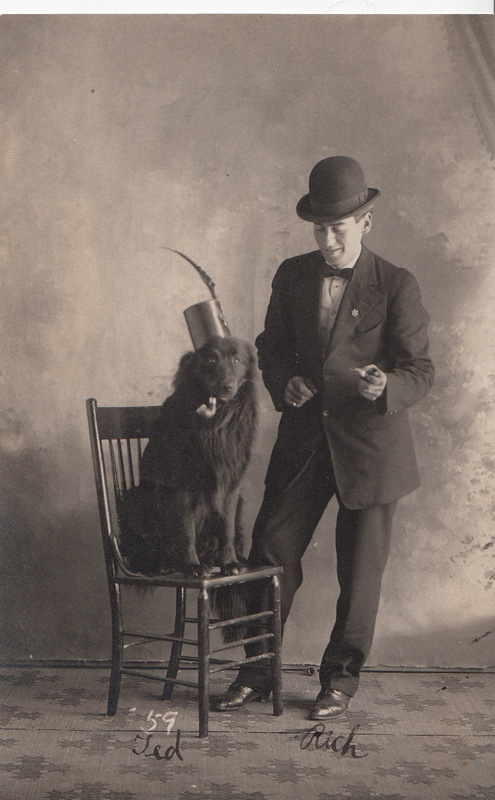 Dressed in a suit, bowler hat, bow tie and polished shoes, Rich looks down at Ted, who I think we can assume is his dog. Their names are written in pen at the bottom of the card. Sitting on a straight-backed chair, Ted looks straight into the camera, clutching a pipe in his jaws and wearing a fez that seems to have been improvised out of a can decked with a feather. Rich has a pipe in his left hand, too. I guess this is intended to be a picture of two pals enjoying a smoke…. I gave a talk last night in Maryland where found myself discussing the humor associated with pet keeping at some length. Pet keeping is often a form of play.